The Triangle has been in a burger renaissance of late. 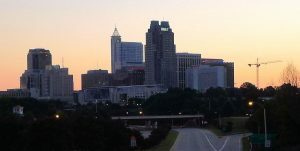 Only Burger, Bull City Burger and Brewery, Al’s Burger Shack, Corbett’s Burgers and Soda Bar, Chuck’s, Bad Daddy’s Burger Bar, BurgerFi, SmashBurger and more. 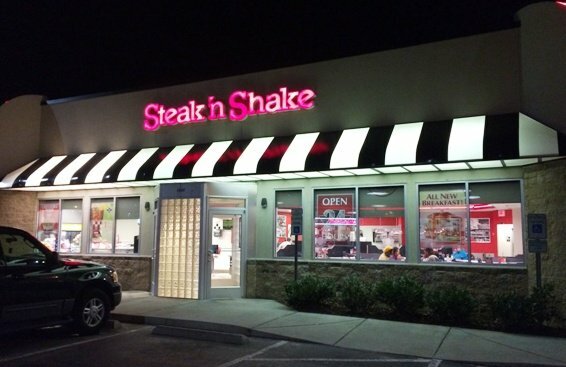 So how does a chain like Steak n Shake fare amidst all this competition? Given that the Steak n Shake on Capital Boulevard is probably the only one in the area for this large chain, I needed to do a re-visit and see where it stood. 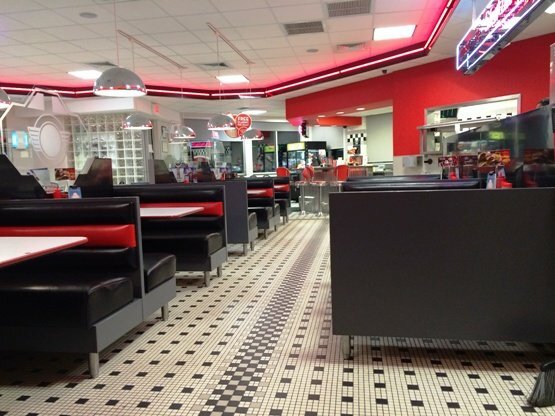 From the outside, Steak n Shake has a classic diner feel with lots of white and red. Inside you add a dash of chrome and booth seating and you feel as if you’re closer to the 50’s than the 21st century. 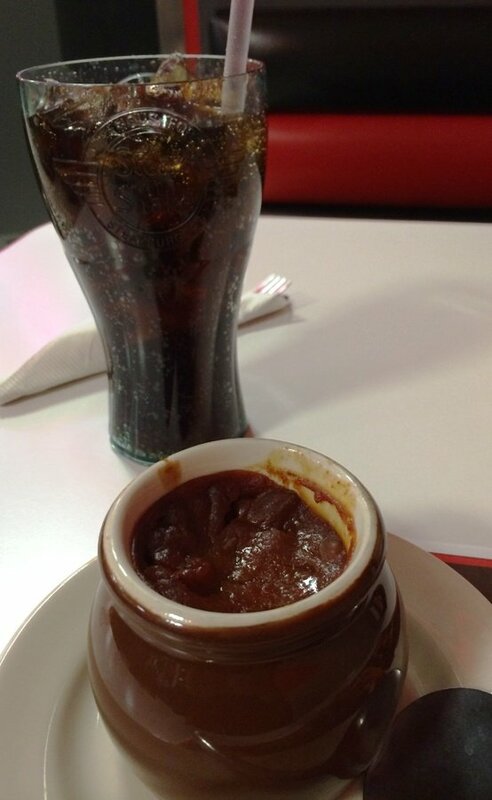 While Steak n Shake is casual dining, you need to be seated and have a wait-person. A bit different when the typical tab here is under $10. 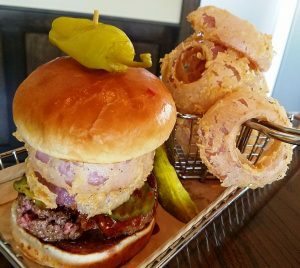 The menu is a mix of burger classics from $4 to $8 with a handful of sides (fries, onion rings, fruit, baked beans and more). They standard burger has two steak patties which are just thinly, pounded burgers, I’d have to guess 1/8 lb. in weight and layered with decent toppings. Their melts (grilled sandwiches) are probably my favorite but I go with the Western BBQ n Bacon burger. It takes about 10 minutes for my meal to come out and it looks decent. A small ceramic pot of beans, pile of thin shoestring fries and a good looking burger. I haven’t been to Steak n Shake in a while so this is my basic meal here. 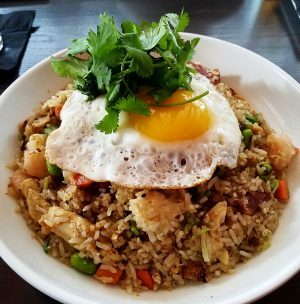 The beans are ok but may be your typical food service type offering. Fries are excellent, I miss these thin cut crispy bad-boys! And the burger? 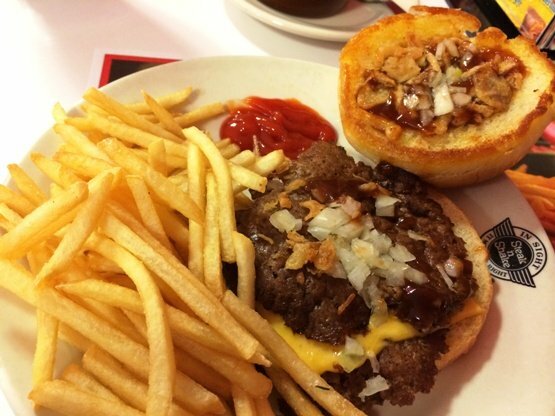 It looks good with plenty of topping (onion bits, chopped onions, bacon) but the thin patties at Steak n Shake means a double is more like a thin 1/4 pounder. It just doesn’t have the heft or meatiness that a good burger should have (according to my research, Steak n Shake patties are 2.2 oz. each). So it’s a tasty burger but not really satisfying.